Ergonomics: Is Your Desk Trying to Kill You? We can’t tell you how many patients leave our clinic feeling great, and then as soon as they go to work they start feeling pain again. Our Oakville Chiropractors treat all kinds of aches and pains, no more prevalent then posture issues from hours and hours…. and hours on the computer. While we can’t correct the fact that your boss/coworkers are a pain in your neck, we can try to make sure the pain in your neck isn’t coming from an improper work station. Our Chiropractic team uses a plethora of modalities and hands-on treatment along with education to help manage your 15 hours a day sitting at the gotrain-computer-gotrain-leafsgame-netflix. Most people spend a significant part of their day on the computer. The posture you have while you work is so important to how you feel at the end of the day. You should be able to sit up straight and have your wrists and forearms parallel to the floor. Your station should be set up so that you can look straight ahead, and you don’t have to look up or down at your screen. Your knees should be bent at 90 degrees, and feet should be flat on the floor. If your screen is positioned too far away from you, you’ll start craning your neck and squinting your eyes in order to read your screen. Our Chiropractors do not think this a good idea. Reach out your arm, and your middle fingertip should touch your screen. 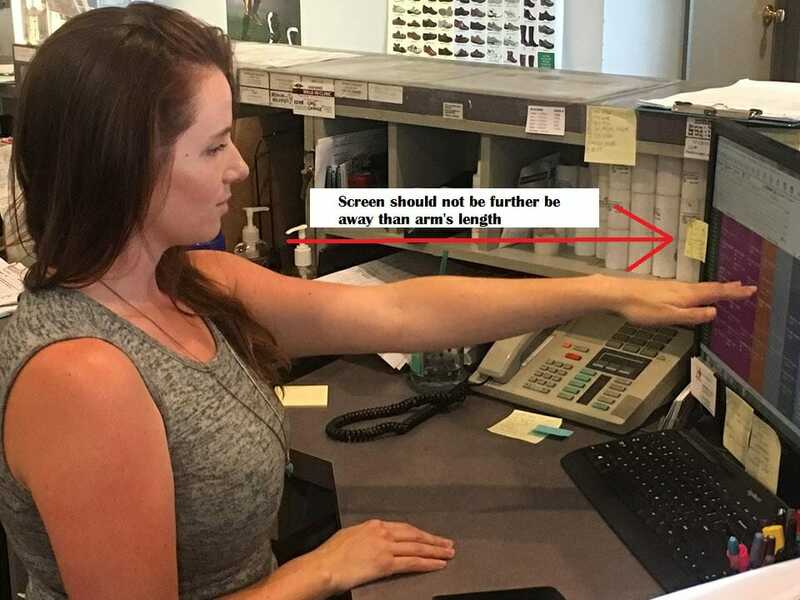 This is the correct ergonomic screen distance. To adjust your screen to the proper height, move the screen so that when you are looking straight ahead you are looking at the address bar on your screen. If you need to bump your screen up, you can use books or even designated risers to boost the height. If you use two monitors at work, they should be set up side by side. You don’t want to have to turn your head to look at either of your screens! It is very important that your chair is comfortable. It should have some lumbar support. This means there should be a cushion to support the curve in your lower back, or the natural shape of the chair should support the curve in your lower back. If your chair doesn’t have this, you can buy lumbar supports to properly equip your workstation. The depth of your seat can usually be adjusted as well. There should be room for a fist between the back of your knees and the edge of the chair. A common sign that your chair isn’t the proper height is that you have to tuck your feet behind you or you end up sitting on one leg/foot. If this sounds like you – fix the chair height! If the chair isn’t adjustable, you can also invest in a footrest or small stool to properly aligned your lower limbs. It is a common ergonomic mistake to cradle the phone between your neck and shoulder. If you use a phone on a regular basis and are required to type at the same time, using speakerphone or a headset is the best option. Cradling the phone between your neck and shoulder can cause headaches, neck pain and upper back pain! All other objects that you use frequently (ie – your stapler) should be within arms reach. Sitting in one position all day is bad for your body. We were designed to move, so sitting all day is not healthy. You should get up from your desk at least once every hour and move around. Get up to get some water, visit the bathroom, take a lap around the office. This is especially important for your spine! The upper back and neck can also benefit from a simple postural exercise. Take a break from the usual computer posture and squeeze your shoulder blades, turn your palms forward, open up the chest and tuck the chin back into your neck. This helps counteract the forward flexed/hunched posture we find ourselves in when we work. Neck and upper back bugging you? Come see Dr. Steve or Dr. Jenn to help alleviate your pain!